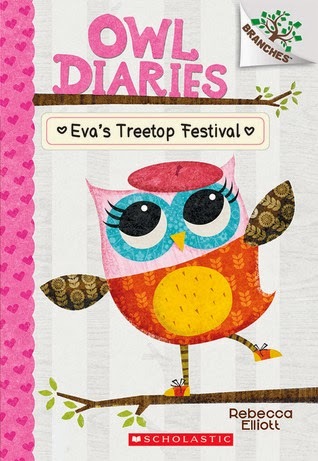 Some days the undemanding and the cute is all that one can cope with, and so I was rather pleased to find Owl Diaries: Eva's Treetop Festival, written and illustrated by Rebecca Elliott (Scholastic, Jan. 2015, from their Branches series of early chapter books) on my shelf of review copies. This diary-format, cheerful book was just right for today's reading level. 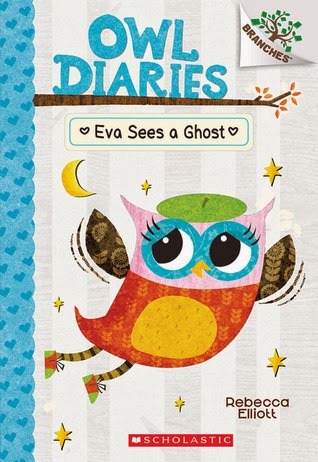 Eva is a young owl of the busy, crafty sort, full of bright ideas and at times a bit bossy. I warmed to her right from the beginning of her self-introduction, because in her list of favorite things there is a word (pumpkin) and in her list of un-favorite things there was another word (plop) and I always like to meet fellow lexophiles. Eva decides to make life more interesting by organizing a "flap-tastic" spring festival, and she has tons of great ideas about what it should include. But Eva thinks she can do it all herself, and it's not until it's almost the day of the festival that she realizes that including others in the work is a good idea! All goes well, for everyone but Eva, who then gets to learn the equally valuable lesson that yesterday's embarrassments can be left to yesterday. The brightly drawn young owls with their big big eyes bounce all over the pages, in way that I think will feel very friendly and familiar to young consumers of graphic content--it's very easy to imagine the owls animated in an interactive computer game! The pinkness of this first book in the series points it toward girls (and the promotional description explicitly says it's for girls)....and Eva isn't exactly smashing gender stereotypes with her main interests (bead crafts and fashion) but I've known several small boys who love those stuffed animals with the really (horrifyingly) huge eyes, and it might well appeal to them too. Especially since the second book in the series, Eva Sees a Ghost (coming in May), goes more toward the blue end of things....And I know for a fact that even an eleven year old boy might, on being shown the picture of Baxter, Eva's pet bat, say something along lines of "oh iss [sic] so cute...."
I enjoyed the first book as well!